Looking for a crispy & quick starter recipe? Then your search ends here...with this crispy flavored paneer fritter recipe. This yummy recipe makes a healthy snack recipe for kids as it tastes absolutely delicious with crunchy coating yet soft inside. Paneer dishes are favorite among my kids. And finger paneer takes the prime favorite for evening tea time snacks. Try crispy paneer fritter snack at your home too with this easy video recipe! Wash and slice paneer to thin lengthy pieces. In a mixing bowl, add maida flour, corn flour, salt, pepper pwd and red chilli pwd. Add few drops of fresh lemon juice. Add little water and mix to thick smooth paste. Add paneer slices to the paste and coat well. Allow to marinate for 30 mins to 1 hour. 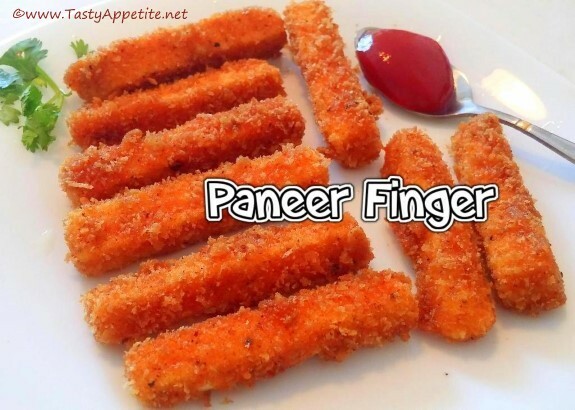 Take the marinated paneer, roll in bread crumbs and arrange in plate. Repeat the same for all the paneer as shown in video. Once the oil is hot, drop the paneer gently in batches. Once the paneer turns crispy & brown, drain from oil in kitchen tissue. Yummilicious Finger paneer with crispy outside and chewy inside is ready. It makes an excellent healthy evening snack for kids. Serve hot with mint chutney, tomato ketchup or any dip of your choice. Since when is fried cheese anywhere near healthy? It looks lush, but stop lying by saying it's a healthy snack.